Are you a planner and journal junkie too? My new favorite thing is carrying my journal around with me everywhere and jotting things down when I have a bit of ideal time. I create lists, write down ideas about anything, and journal about what is going on in my life. One thing I love to add to my pages are STICKERS! 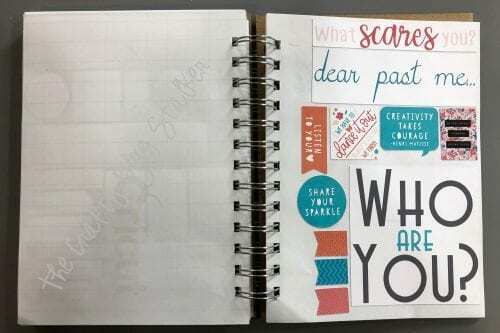 Planner stickers are a fun way to dress up any page in my journal and make them something fun to look at. 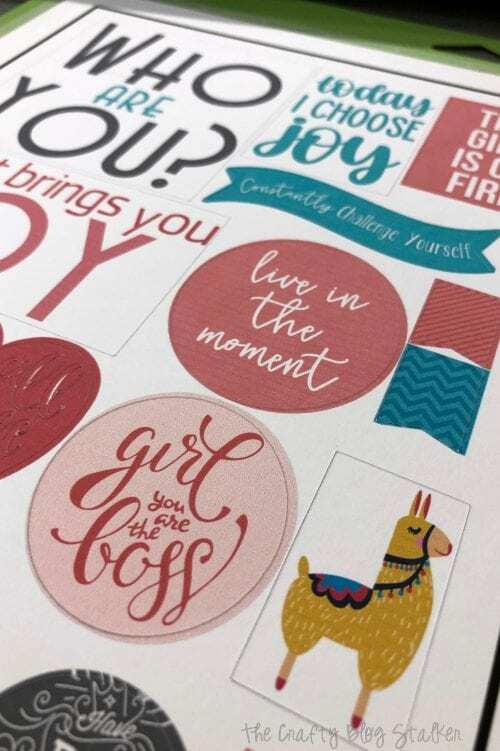 Since I know you love stickers too, I have created a Print then Cut file in Cricut Design Space that you can use too! 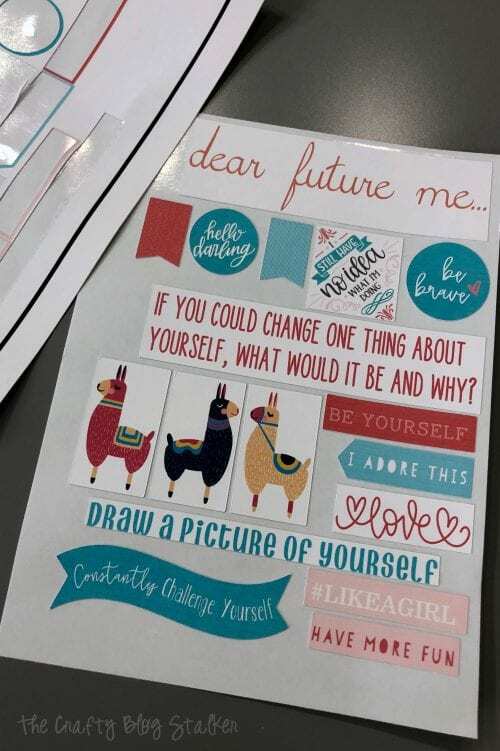 It includes writing prompts, inspirational sayings, and cute lamas. Who doesn’t love lamas?! 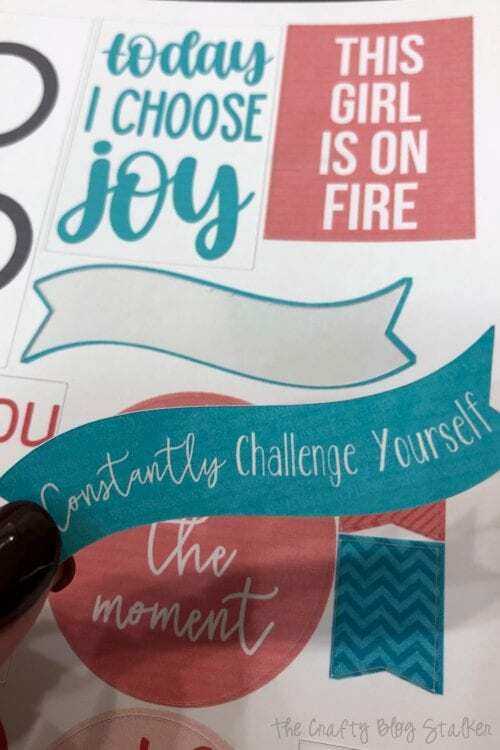 All you have to do is Print on your home printer, and then cut them out on your Cricut cutting machine. Don’t worry if you have an older printer, I do too! My printer is an HP Deskjet 3051A, you can’t even buy them anymore, but it works great for print then cut! Not sure how to print then cut? Let me show you how! You’ll be hooked! 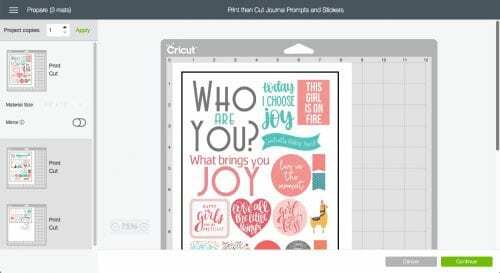 Begin by clicking on this link to go to the stickers file in Cricut Design Space. If you would like to adjust the size of the stickers then click on Customize, otherwise you can click directly on Make It and not have to make any changes. 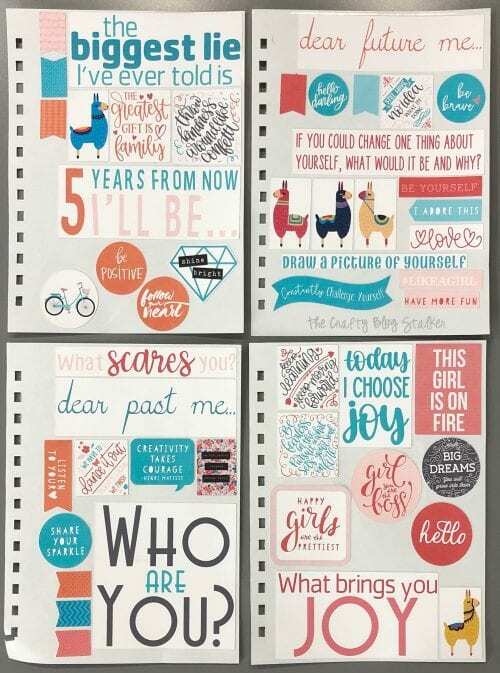 These stickers were designed for a journal that is 7.5″ x 5.5″. If you do decided to customize, I suggest to select all the images and resize at once so they stay proportional. 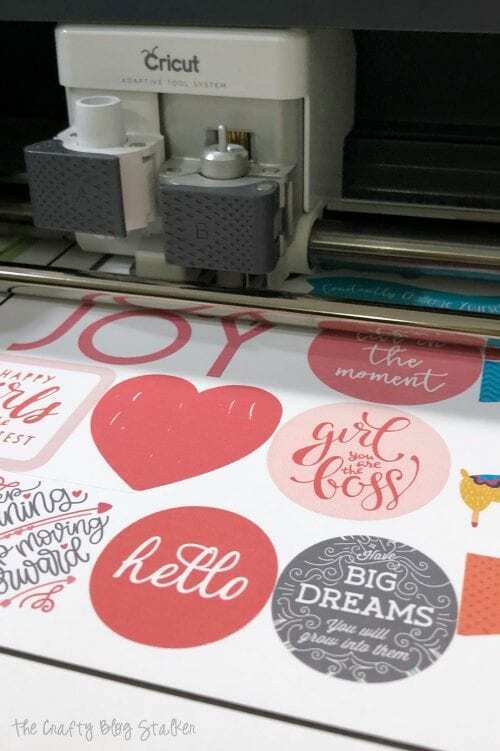 Once you click on Make It, you will be taken to a preview screen of what your stickers will look like after they are printed and on a cutting mat. Click on Continue in the bottom right corner. On the next screen you Send To Printer, so make sure your printer is connected to your computer or device. 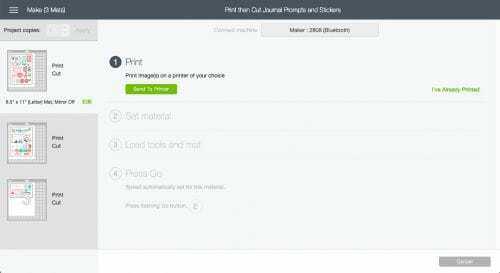 On the Print Setup you can choose how many copies you want to print and if you want to add bleed. Bleed will extend the outer border of the sticker so that when you remove the sticker from the sheet there is no white border. You can uncheck bleed but there may be a white border around the edge of your sticker. I chose to add the bleed and you’ll see later how that looks after it is cut. Double check your printer screen to make sure everything looks good. Printable Sticker Paper isn’t an option with my printer but the plain paper option works great. 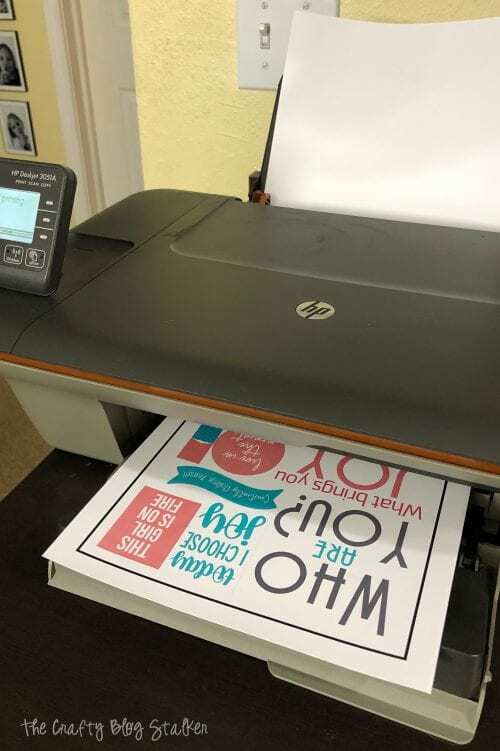 If this is the first time you are doing print and cut with your printer you may want to print a test page to make sure it looks as it should and the thicker sticker paper feeds ok.
*This screen may look a little different depending on your home printer. Once you are ready to go, click print to send to the printer. OOHH look how pretty!! The black frame around the images is the registration guides for when you go to cut on the Cricut cutting machine. The machine can read those lines and know that it is cutting in exactly the right spot. You will have to go through the print screen for each sheet of stickers. It will not print all the sheets at once. Now that the sheets are printed, it is time to cut them! 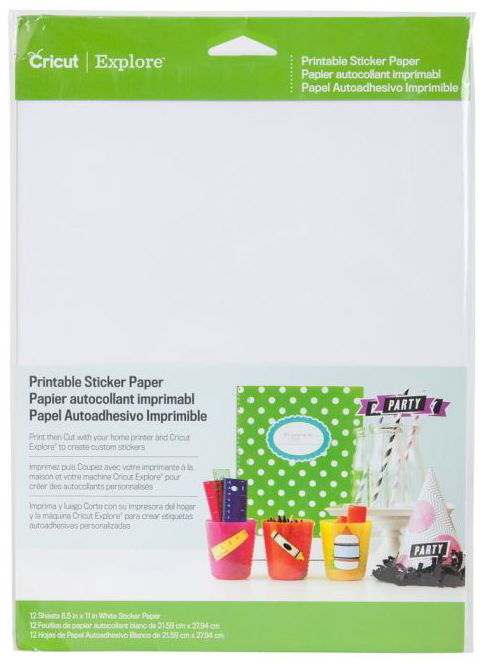 In Cricut Design Space select Sticker Paper, or whatever material you are using. If you don’t see it displayed select Browse All Materials and select your material from that menu. 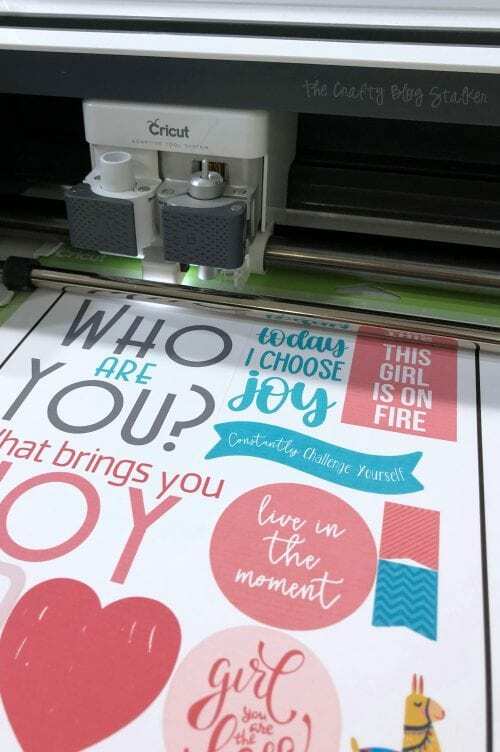 This is an important step because you are telling your Cricut Maker how much pressure to use when cutting the stickers. 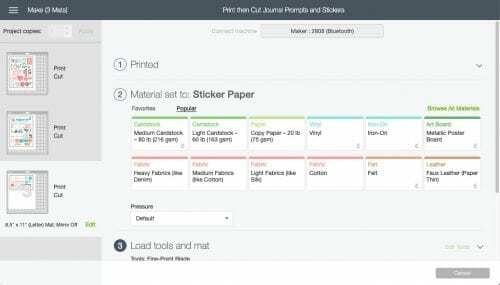 Lay the printed sticker sheet into the top left corner of the Standard Grip Mat and follow the prompts on the Cricut Maker. When the arrow light blinks, you are ready to load the mat. When the Cricut light blinks you are ready to begin cutting. Once the Cricut has begun, you will see a small light underneath the blade housing. This is the machine searching for those registration marks and confirming where it should cut. It will check for the line in several places. 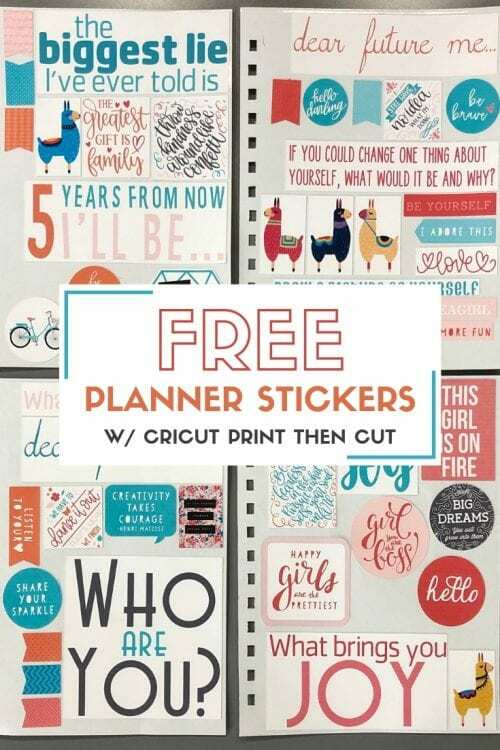 Then the Cricut Maker will begin cutting out all of your wonderful new planner stickers! The Cricut is so smart and knows exactly where to cut! Once one sheet is complete, remove the sticker sheet from the mat and put the next printed sheet on the mat. Repeat until all sheets are done. Here you can see the bleed with the Constantly Challenge Yourself Sticker. Remember, we chose to have the bleed area on the print. Once the sticker is removed from the backing sheet, there is no white border around the sticker and there is a border of the sticker on the backing sheet. 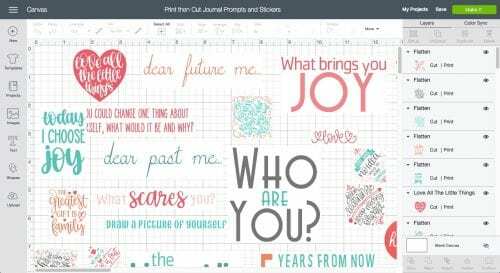 Technically you are done and your stickers are ready to dress up your journal or planner pages. BUT I took this one step further. I also made a Unique Writing Journal, and I wanted these stickers to be bound in with that book. To make it a little easier, I removed the excess sticker paper from the backing sheets, and then cut the backing sheets to the size of my journal. Then I moved each sticker to the backing sheet. I finished transferring my stickers and had 4, 5.5″ x 7.5″ sheets. Then I cut the spiral holes using my Zutter Bind it All. The book came together really well! You can see exactly how I made it by going to the tutorial, How to Make a Unique Writing Journal. 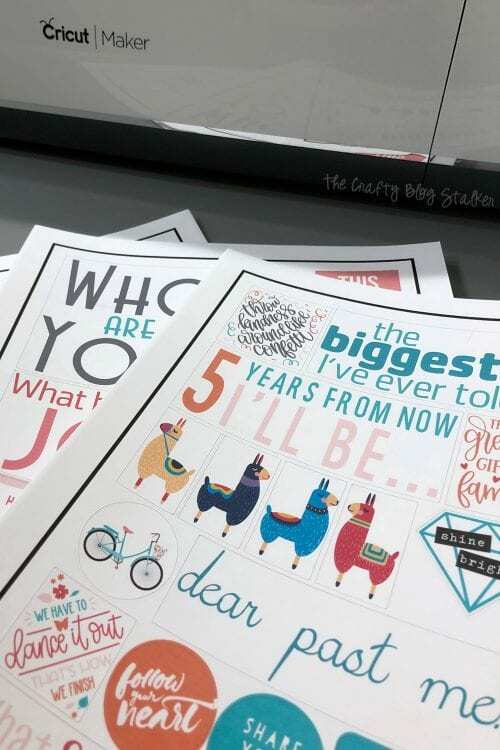 Here are my print then cut planner stickers bound in my book! If you don’t want to create your own unique writing journal, that is totally fine. 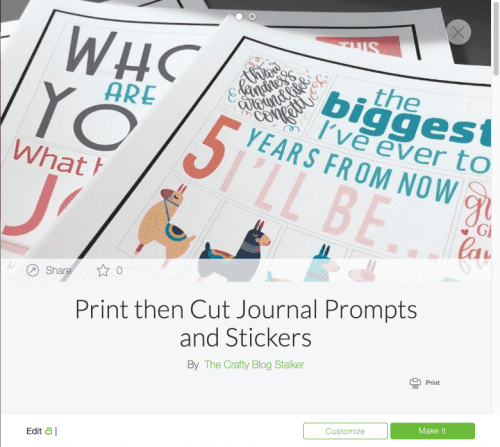 Simply print then cut your stickers and keep them with your journal supplies! 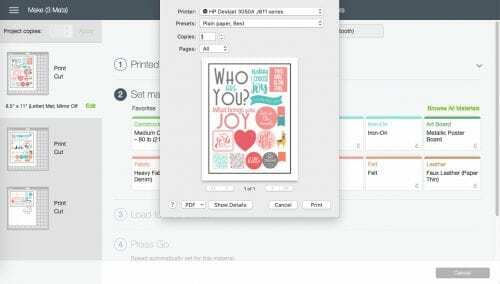 Do you want to learn how to design your own print then cut projects in Cricut Design Space? I have a tutorial with a video for that! 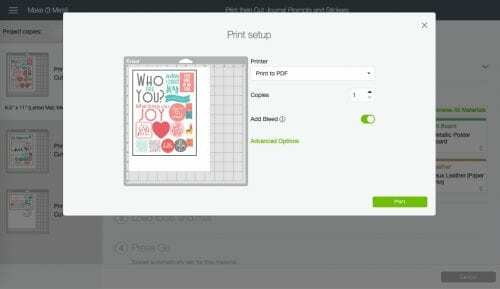 Click here to go to How to Print and Cut in Cricut Design Space. Don’t have a Cricut Maker, don’t worry! 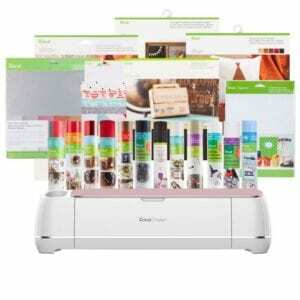 Cricut offers bundles so you can get everything you need to get started at a great price! Click here or the image below for more information. How do you like to journal? Share and leave a comment below! 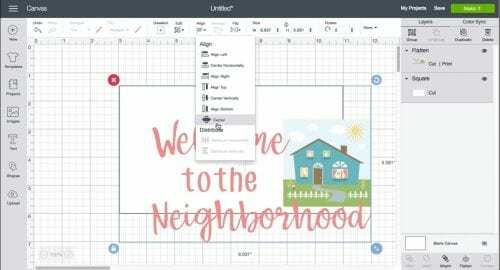 SAVE FREE PRINTABLE STICKERS FOR YOUR PLANNER WITH CRICUT PRINT THEN CUT TO YOUR FAVORITE PINTEREST BOARD!